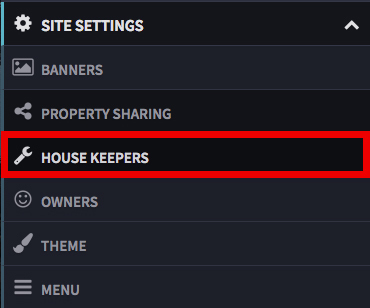 SCRUMPY gives you the ability to assign housekeepers to your properties. Housekeepers will be able to see upcoming bookings within their portal, accessing information about the bookings that apply to them. They will be able to see the lead bookers information, room configurations, any notes that have been added, pets assigned, chargeable extras booked and how many guests are arriving. Once selected you will see an 'Add Housekeeper' button click this to add a new housekeeper to your site, fill in the housekeepers details. If you want the housekeeper to see detailed information about the booking such as contact information, enable the check labelled 'Display Detailed Booking Information to House Keeper' once finished click 'Create Housekeeper'. Now that you have added your housekeeper you will need to assign them to your property if you want them to be the default housekeeper meaning any bookings made at that property will be assigned to the housekeeper assigned - you can override this on a per booking level. Once selected you will see a 'Housekeeper' section, select the drop down menu and assign your housekeeper - click 'Update Property' to save your changes. Now all bookings made will be assigned to the default housekeeper. If there are any areas on the SCRUMPY system you are unsure of please feel free to get in touch and we can talk you through these. Alternatively if you go to help.scrumpy.co.uk you will find lots of help articles and advice to ensure you're making the most of your SCRUMPY website.